David Hall’s legal challenge to the €3.06 billion Anglo promissory note was dismissed by the High Court last week but he intends to appeal to the Supreme Court this morning despite the overnight developments. 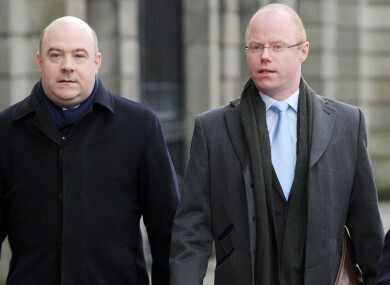 David Hall (Left) and independent TD Stephen Donnelly arriving at the Four Courts in Dublin last week. THE SUPREME COURT will hear a Dublin businessman’s legal challenge to the Anglo Irish Bank promissory note this morning despite the passing of late night legislation aimed at avoiding the payment at the end of March. David Hall is hoping to make a full appeal against the ruling by the High Court last week that he did not have the standing to challenge the legality of the €3.06 billion promissory note payment that is due at the end of next month. The case is due for mention after 10.15am this morning and Hall intends to press on with his case irrespective of the decision taken by the Oireachtas overnight to liquidate IBRC, the former Anglo Irish Bank. His legal team has been monitoring developments in the Dáil and Seanad in the early hours of this morning and will be in the Supreme Court this morning along with a number of TDs who support the case. High Court President Justice Nicholas Kearns ruled last week that Hall did not have the standing, or what is known in legal parlance as locus standi, to take the case, saying any challenge to the payment would need to be mounted by a member of the Dáil. Hall had argued that the controversial and much disputed payment was illegal as the issuing of the €31 billion in promissory notes in respect of the now defunct Anglo three years was illegal as it was not approved by a Dáil vote. The State argued that the payments did not require Dáil approval as the Minister for Finance had already been given the authority under the Credit Institutions Stabilisation Act. The High Court found that Hall could not argue that he had been put in a position any different to any other citizen because of the promissory note payment. In addition, Justice Kearns said there had been significant delay in bringing the legal action. He also said in his ruling that there might be “every reason to suppose” that declaring the notes invalid would have “very serious adverse implications” for Hall, Irish citizens, the State’s finances, its financial reputation and Ireland’s ability to continue its economic recovery. Justice Kearns did say that no member of Dáil Éireann was precluded from mounting a legal challenge with the independent TD Stephen Donnelly, an outspoken critic of the promissory note payments, said to be considering such a move. Hall is expected to appeal the locus standi finding – that he did not have the standing to challenge the payment. But it is understood that the Supreme Court may be asked to hear the entire case as Hall believes the Justice Kearns’ verdict last week could have implications for any future legal challenge to any decision made by government or the Oireachtas. Email “Legality of promissory note to be challenged in the Supreme Court today”. Feedback on “Legality of promissory note to be challenged in the Supreme Court today”.